At All Season Financial Advisors, we do our best to communicate effectively. Our regular Red Sky Reports assist in client awareness and serve as timely alerts to the dedicated reader. We hope that all of you are willing to read our weekly digest, but understand that there are hundreds (if not thousands) of other “up to the moment” media to consume on any given day. In this edition of the Red Sky Report, we wish to draw specific attention to our periodic “Calling All Cars” announcements. 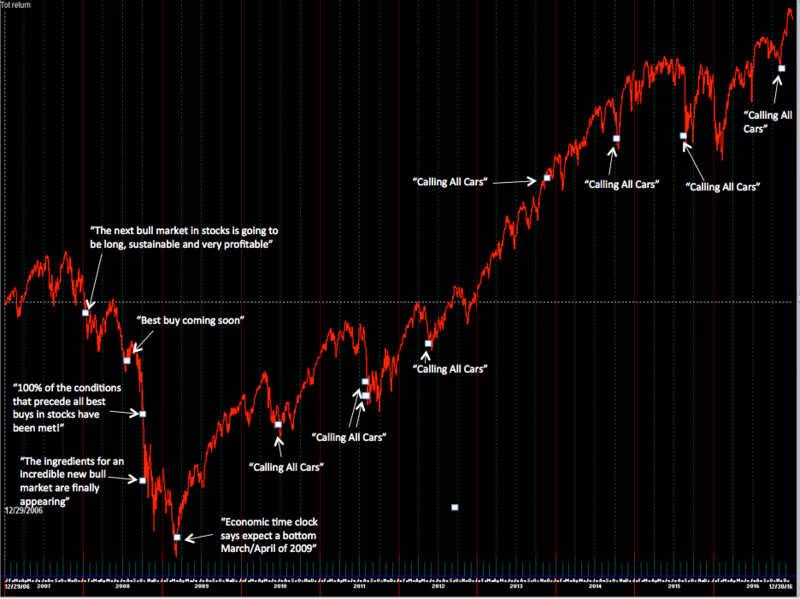 We have used the “Calling All Cars” term for over a decade to indicate when we see a buying opportunity in the market. These periodic alerts serve as a tailwind or tipping point in the decision-making process to those with cash reserves sitting on the sidelines. As your investment advisor, it is our job not only to manage the money you have entrusted to us but to inform you when we are convinced of a buying opportunity. Take a look at the S&P 500 over the last decade annotated with comments from Red Sky Reports and Calling All Cars announcements. We aim to use this edition of the Red Sky Report as a one-two punch in regard to building confidence in our firm. First, we would like for our clients to review the Red Sky Report regularly for updates to market forecast, trends, and signals. Specifically, keep a look out for reports that carry our “Calling All Cars” title. Secondly, we want to provide “proof” in the pudding, while maintaining that humble pie is appropriate for all occasions. In general, the “Calling All Cars” announcements should resonate strongly with investors that hold longer time horizon type accounts (IRA, 401(k), 529 and other retirement accounts) but is not a limited announcement pertaining only to these investors. These retirement accounts regularly have yearly maximum contribution amounts and are often spread between multiple providers, former employers, or institutions. We hope to use the data presented above to spur into action anyone that has cash sitting on the sideline, an underperforming account, or an account with a former employer/outside institution. These accounts may be used to your benefit as we calculate the next “Buy Zone” and deploy new funds appropriately across our strategies. Please take a look at your accounts, those held with All Season and those held elsewhere, and let us know if we might be able to further assist in your specific situation.